Given the growing interest among psychotherapists of all theoretical orientations, this year long program will explore the integration of mindfulness in psychotherapy. You will be able to work with a wide population such as children, families, spouses, women, and LGBTQIA. You will learn to work with process-based interventions that help you analyze your own work as an individual and therapist. You will learn to incorporate the modalities learnt across cultures and settings. Certification: Certificate of Completion by Pause for Perspective, Hyderabad. Five Modules. Each module lasting four full days. Each module starts on Thursday and ends on Sunday. Timings 10:00 am to 5:00 pm. Each module has a gap of three months. Days: Thursdays to Sundays. Each module. Supervision: Once in two weeks in-person supervision between each module. Who can attend: Only for practicing mental health professions including psychologists, social workers, psychiatrists, clinical psychologists, life coach. The requirement is that you have a practice where you see clients in therapy/counseling. This program is for professionals who want to incorporate Mindfulness in their work. 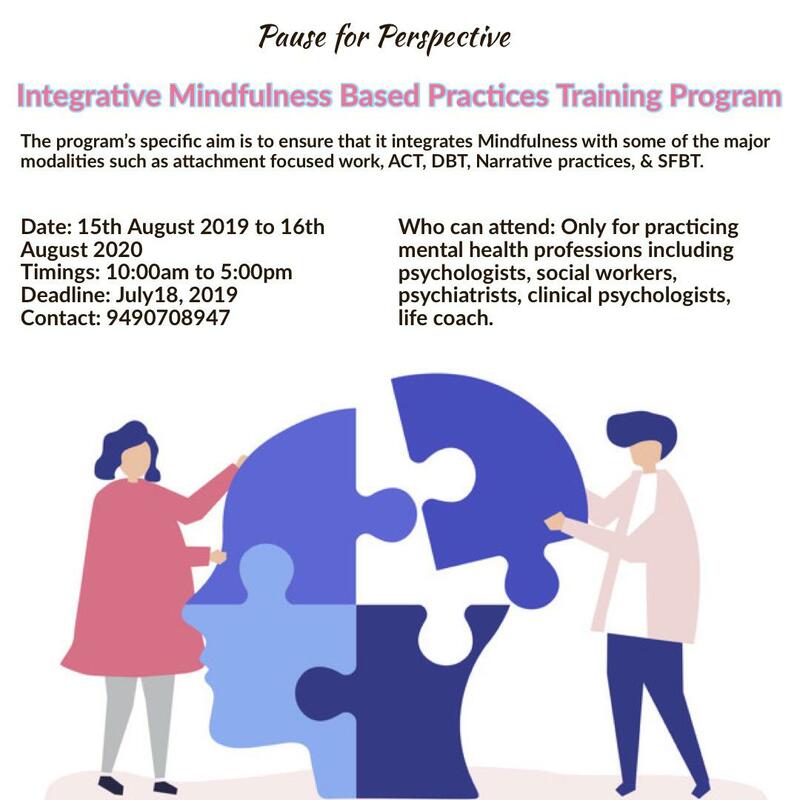 The program’s specific aim is to ensure that it integrates Mindfulness with some of the major modalities such as attachment focused work, ACT, DBT, Narrative practices, & SFBT. Teaching is delivered through lectures, role-plays, supervisions, experiential exercises and more.